The RegioStars Awards will identify good practices in regional development. The period to submit projects is running from 19 February to 9 of May 2019. The RegioStars Awards 2019 edition has just been launched: https://ec.europa.eu/regiostars. It will identify good practices in regional development, and highlight original and innovative projects that are attractive and inspiring to other regions. The period to submit projects is running from 19 February to 9 of May 2019. An independent jury will select the finalists. 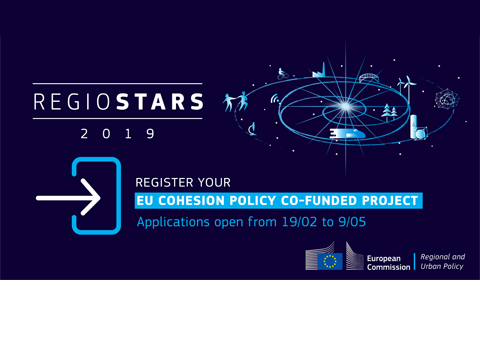 Following a public vote, the Prizes will be awarded at the RegioStars ceremony during the EU regions week (7 October 2019). Last year 21 projects were selected as finalists and six were rewarded. It is crucial that the competition attracts as many projects as possible, in order to showcase how Cohesion Policy supports people through innovation, economic growth and jobs creation at a regional level. Innovative character of the project in the selected award category. Good results and impact of the project in relation to its initial objectives and impacts.